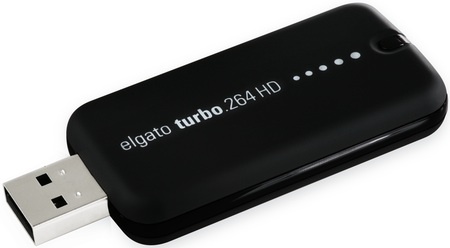 Mac TV tuner specialist Elgato has updated its Turbo.264 video conversion dongle by bunging 'HD' on the end of the name and equipping it with the ability to handle 1080p content. The Turbo.264 is all about converting video content into the H.264 format favoured not only by Apple's iPod, iPhone and Apple TV devices, but also the Sony PlayStation Portable and other gadgets. So far, the dongle's done a good job of accelerating the process of converting any video format supported by Apple's QuickTime - including codecs plugged into QuickTime by third-parties, so that means WMV, FLV, AVI and a host of others - into H.264 in device-friendly forms. Elgato said the new unit provides a big speed boost over the original, and adds support for the camcorder-oriented AVCHD hi-def format, in addition to HD encoded in MPEG 2 and MPEG 4 forms. The Turbo.264 software will automatically detect the connection of an AVCHD camcorder to your Mac so you can transcode footage straight from the camera onto your hard disk. Review Enough functionality to fight YouView et al?